Thanks to a contribution from a benefactor, the Kenilworth Chess Club will be sponsoring 1 full U.S. Amateur Team East entry next month. To be eligible for the sponsorship, teams must have 4 Kenilworth CC members and include Kenilworth in its name (in a non-derogatory way). For help in forming a KCC team, reply via email or see an officer (Bob S., Joe R. Geoff, Mike G. or John) during the next 2-3 meetings. Last year, the Kenilworth Niners (Mark K., Greg, Geoff & John) tied for 1st among U1900 teams. One more thing... tonight is your last chance to enter the Club Championship. The Club Championship started last Thursday. I had not played any slow games of chess in a while and I was feeling rusty. Fortunately, I got an easy pairing and I was able to take the full point. I hope to see you at the tournament. Tonight's KCC meeting has been canceled due to weather and travel concerns. 1. In the next 10 days, or so, the KCC Minutes blog, which has experienced some technical problems for the past year, will be shelved and replaced by the Kenilworth Chess Club blog. 2. 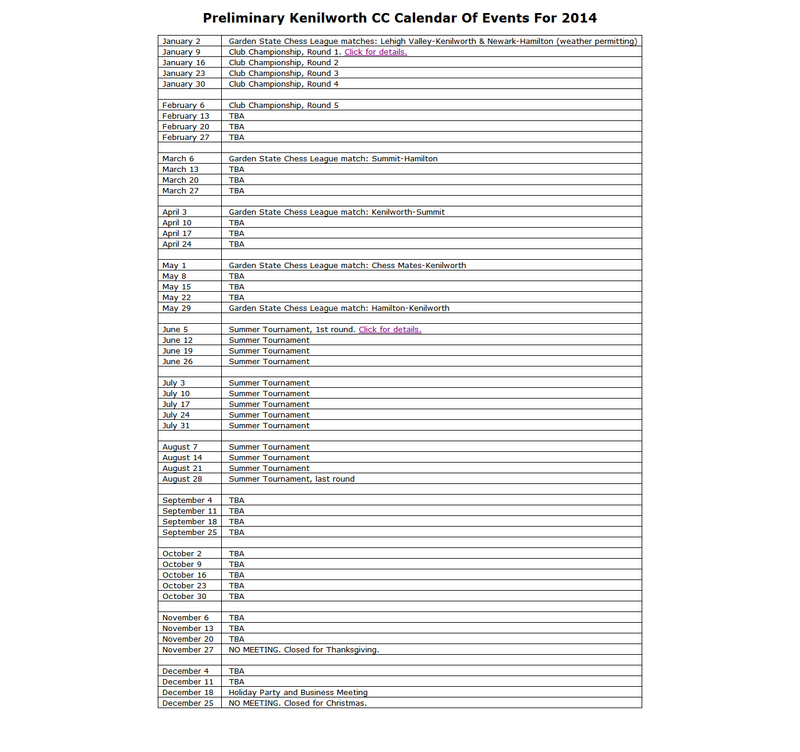 A link to the KCC Tournaments blog will be placed on the home page of our web site. 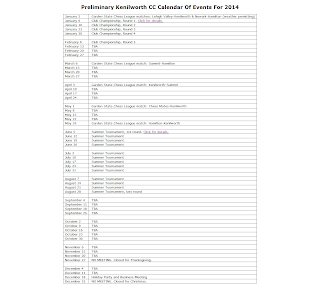 The Kenilworth Chess Club's preliminary Calendar for 2014 has been placed online and can be downloaded here. Only a few events, notably the Club Championship (January 9-February 6) and Summer Tourney (June 5-August 28), have been scheduled thus far. Dates for the Irving Ellner and Sy Fish memorials haven't been set, as yet. Places for a Knockout tourney, early rounds of the 2014-5 GSCL season and some new, members-only events, such as a Blitz Championship and a Quick Championship, will also be found. Candidates to fill the remaining weeks include a Consultation Game, lectures, simuls, Random Opening, Bughouse and Partner tourneys. If you have any event-ideas, please relay them to us.